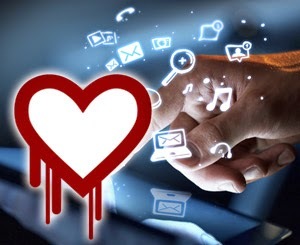 Ci2 Group: What is the Heartbleed Bug? As you are aware the Heartbleed Bug issue is very much in the news right now. Many websites with security certificates (recognized with HTTPS:// at the beginning of the URL website address) are vulnerable. Heartbleed exploits an element of the site's security called OpenSSL. It allows malicious hackers to obtain personal information such as passwords etc. Be careful where you go on the internet. The Canada Revenue Agency (CRA) temporarily shut down their site to remedy the situation on their end. Canadian banks appear to not have been compromised. When visiting a site you log into, check and see if they have a statement on how they have handled the issue. It is recommended you change your passwords. You can also clear your "cookie" settings and delete your cache of temporary internet files - you can do this in the settings area located in your browser's menu. The safest measure is to not access the sites you log into until you hear this has all been rectified. If you require more information please feel free to contact us! copyright Ci2 Group inc. Simple theme. Powered by Blogger.